Inspections & Repairs are handled between you and the MWC Certified inspectors & contractors. 1) Moisture Warranty will provide you with a list of certified stucco inspectors. 2) You contact them directly, or at your request we will contact them for you. 3) The inspection is reviewed by one of our specialists. 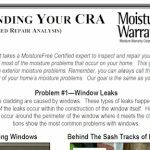 If repairs are necessary to meet warranty requirements, MWC will produce a Certified Repair Analysis (CRA) that outlines exactly what will be needed to qualify the home for warranty coverage and to guide you through the repair process. In turn we provide you with a list of certified repair contractors which you contact directly, or at your request we will contact them for you.